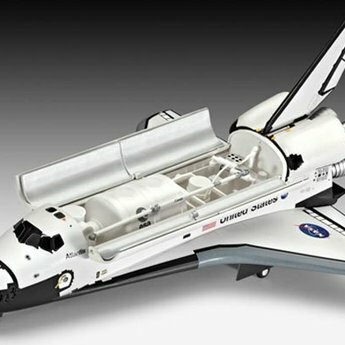 By the American space agency Nasa developed the Space Shuttle is the only space transportation system in the world that can be reused. It consists of the components space shuttle (orbiter) with three reusable main engines, external fuel tank and two solid fuel rockets with a starting total power of 12.46 MN (1,270,566 kg of propellant). The space shuttle can also carry a payload of 24.5 tonnes and 7 astronauts in low earth orbit between 200 and 650 km. The fourth space shuttle Atlantis has been deployed since October 3, 1985 for 35 assignments. In 2012, the shuttle program was put stop after more than 30 years. Also available as model kit (64 544). Including paint (9, 79, 301, 371) + adhesive + brush.